The Direct Benefit Transfer scheme for LPG Subsidy Scheme crossed registration mark of ten crores. 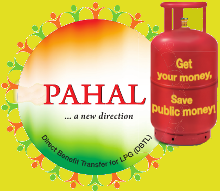 The scheme now covers approximately 66% of the country’s 150 million consumers of liquefied petroleum gas (LPG) under the modified version of the Direct Benefits Transfer in LPG scheme launched nationwide on January 1.The petroleum ministry the government had transferred Rs 4,299 crore since November 15 to consumers in 113.3 million transactions. China,Mexico and Brazil also have direct benefit transfer schemes like PAHAL but no where the beneficiaries are more than 2.2 crores. It is the largest cash transfer programme in the world. It covers more than 9.75 crore LPG consumers with the objective of weeding out duplication and plug leakages.This scheme will help the government to save 10-15 per cent of the Rs 40,000 crore annual LPG subsidy. The scheme has witnessed massive enrolment in a short span of time.The success of the scheme is basically a result of an intensive Information-Education-Campaign comprising advertising through various means, direct reaching out to consumers, and dealer level campaigns.DBTL is designed to ensure that the benefit meant for the genuine domestic customer reaches them directly and is not diverted. By this process public money will be saved.